L: 34" x W: 58" x H: 1.5"
Black Wall Mirror w/ Silver Nailheads This black wall mirror with silver nailhead accents brings impressive depth and dimension to any room. This black wall mirror with silver nailhead accents brings impressive depth and dimension to any room. 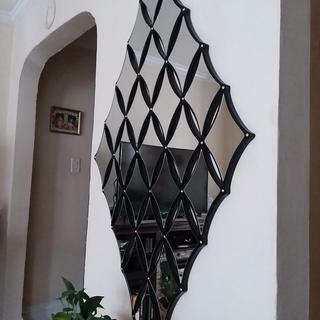 We hung this mirror right over our our couch on the wall in the living room. It looked absolutely beautiful. It added a certain vision the to the room. Would highly recommend. One of the most amazing, elegant pieces I got for my house, I bought two of it, they were not cheap but they’re worthy, I love it!! I used two of these in my foyer for depth. They look amazing. Very well made mirrors. Im very excited! I could not be more happy with the service that I got at the Rt.17 Paramus store. Great customer service as I dealt with the store mgr. on duty.that day. This mirror can be hung vertical or horizontal, did it both ways and ended up with it vertical. Has many hooks installed already on the back of mirror, great feature . Hi Jeff! We're so happy to hear that you are enjoying your new wall decor. We will be sure to pass along your great feedback to the Paramus showroom. It looks amazing! It looks awesome and get so many compliments! I love this piece it can either be used horizontally or vertically and is just beautiful! It looks awesome and get so many compliments! My wall is sheet rock. Would the mirror be to heavy to hang? BEST ANSWER: Yes, would suggest using an anchor possibly or finding the beam in your wall to drill in to with screw. I used stainless steel screw from Lowe’s with no anchor and mine is fine . My wall was sheet rock also. Used two molly bolts & its been hanging for 4 years with no trouble. Still get compliments on it. Go for it & enjoy! No. My wall is she but we hung it with Mollie screws. We love our mirror. No, actually it isn't heavy. Very nice looking mirror. I recommend it. Ours is too. No problem at all. Just use an anchor with a screw. Can this also be hung horizontally? BEST ANSWER: Yes. The Black Wall Mirror can be hung horizontally. The dimensions on this product seem really large...can you tell me what the actual width and height of this mirror is please? I know what Demensions are listed but I don't think it's correct. It shows 58" W - that's almost 5 feet. I think that might a misprint.